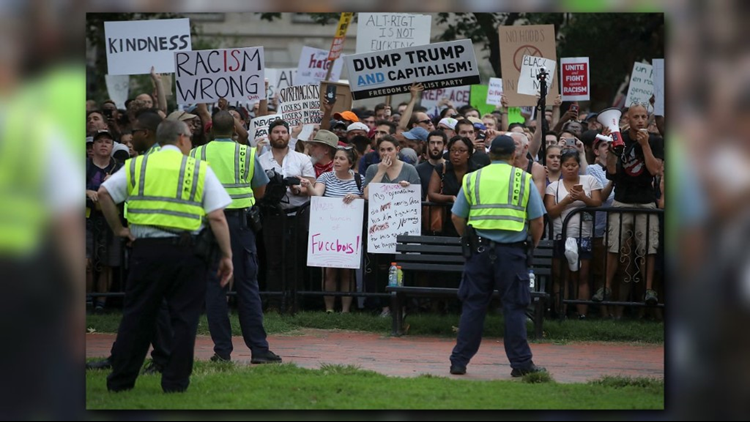 It's been one year since a rally in Charlottesville, Va. turned violent, leaving one woman dead and 19 injured after a man rammed his car into a crowd, and now the same group that organized the rally is protesting in DC. It's been one year since a rally in Charlottesville, Va. turned violent, leaving one dead and 19 injured after a man rammed his car into a crowd. Two Virginia State Police officers also died in a helicopter crash covering the clash. Sunday the same group that organized the rally is in DC to mark the anniversary of what they call a "violation of civil rights." Follow a recap of the events below (APP USERS TAP HERE).